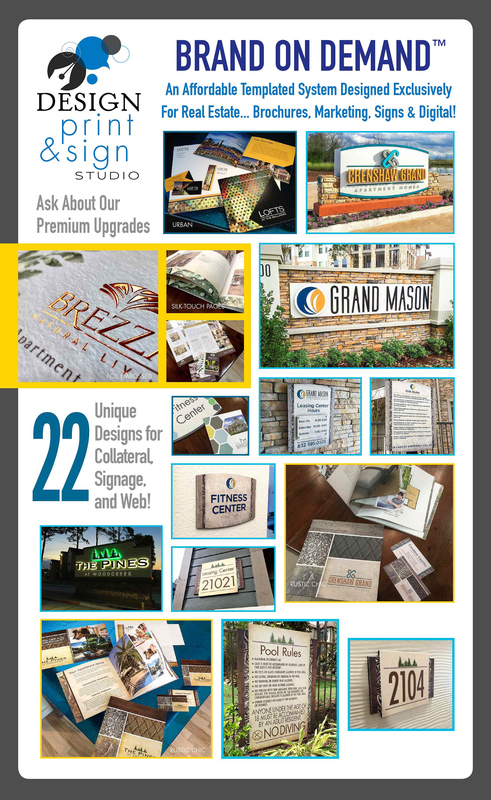 Design Print & Sign Studio is an innovative templated system. An alternative to custom print, signs and web, this is the affordable option for budget-conscious projects. There are 22 unique themes. A client can select a theme that best suits a project, use one of the provided color palettes or request custom colors. In print, several marketing tools are available such as five different brochure options, business cards, one sheet flyers, promo cards, thank you/follow-up materials, postcards, stationery and more. Signage is also designed to be durable, graffiti-resistant exterior grade high-pressure laminate with ADA options. Signs are consistent with the print campaign so the entire branding is strong and dynamic. Monuments or building identity is available with the entire product line. PLUS… Ask about our AMAZING signature web series! Many clients choose to add materials as they need them due to the versatility of the system. Re-ordering is also easy and simple! For more info, call 1.855.7.DESIGN! Whatever the budget, Robinson Creative can provide a creative solution! The client decides either complete, award-winning custom design or the innovative Design Print & Sign Studio. Creative branding isn’t limited to budget anymore.